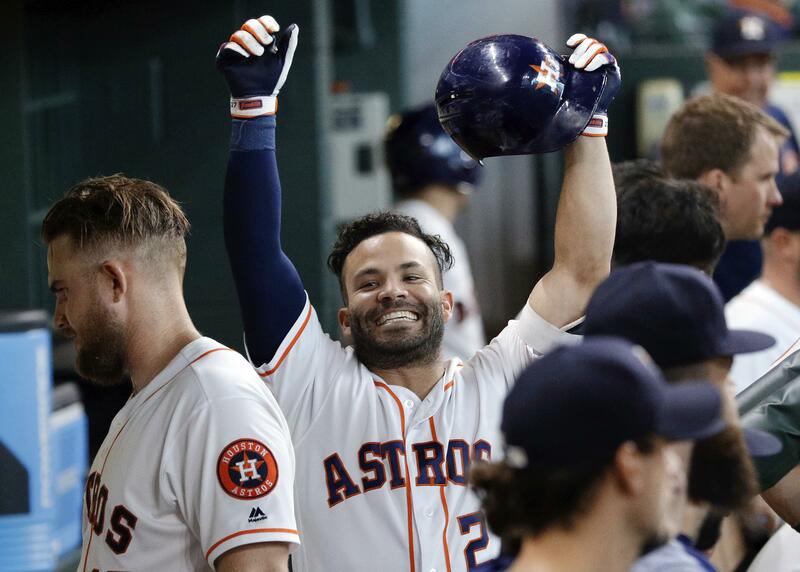 Wed., April 25, 2018, 10:30 p.m.
Justin Verlander pitched seven sharp innings, American League MVP Jose Altuve hit his first home run of the season and the Houston Astros beat the Angels 5-2 on Wednesday, ending Los Angeles’ road winning streak at a team record-tying 11. Albert Pujols connected off Verlander for his 619th career homer. Pujols has 2,994 hits. Alex Bregman hit a three-run double and Jake Marisnick homered as Houston avoided a three-game sweep. The Angels also won 11 straight road games in 1988. Verlander (4-0) held the Angels hitless into the fifth inning. He gave up two runs and four hits, striking out nine without a walk. Verlander won his 11th regular-season decision in a row. Ken Giles pitched a scoreless ninth for his second save. Nick Tropeano (1-2) retired the first 11 batters he faced, striking out six. Indians 4, Cubs 1: In Cleveland, Indians reliever Andrew Miller exited with tightness in his hamstring in the win over Chicago and could miss a few days. Miller grabbed the back of his leg after throwing two pitches to Anthony Rizzo in the seventh inning. Francisco Lindor and Edwin Encarnacion hit sixth-inning home runs off Jon Lester (2-1). Miller relieved Trevor Bauer (2-2) with a runner on first and Cleveland leading 3-1. Cody Allen pitched the ninth for his fifth save. Rays 8, Orioles 4: In Baltimore, Rays lefty Jonny Venters returned to the majors after a six-year absence and his fourth major elbow surgery, retiring the lone batter he faced in a win over Baltimore. The 33-year-old Venters has had three Tommy John surgeries. He was promoted from Triple-A earlier in the day, and got Chris Davis on a grounder. Joey Wendle had three hits and two RBIs, Adeiny Hechavarria homered and the Tampa Bay beat former teammate Alex Cobb (0-3). In his three starts since signing a four-year, $57 million contract with Baltimore, Cobb has yielded 17 runs and 30 hits. Rookie Andrew Kittredge (1-2) got two outs in the fifth to earn his first major league win. The Orioles have lost 10 of 11. Braves 5, Reds 4: In Cincinnati, prized prospect Ronald Acuna Jr. singled and scored the tying run in the eighth inning of his big league debut as Atlanta beat Cincinnati. The 20-year-old Acuna became the youngest player in the majors when he was called up from Triple-A before the game. He went 1 for 5 and played left field. Ozzie Albies, the second-youngest player in the bigs at 21, homered for Atlanta. He was hit by a pitch to begin the ninth and later scored on the go-ahead run on Johan Camargo’s second double of the game. Dan Winkler (1-0) pitched a perfect eighth and A.J. Minter worked the ninth for his first career save. Marlins 8, Dodgers 6: In Los Angeles, Trevor Richards outpitched Clayton Kershaw just months removed from working as a substitute elementary school teacher, and Miami took advantage of a wild outing from the Dodgers ace. Richards’ offseason jobs have included teaching and working for the MillerCoors brewery since going undrafted out of Drury University. He joined a Marlins’ Class A affiliate in 2016 after being noticed while pitching for Gateway of the independent Frontier League for two seasons. J.T. Realmuto homered twice and Miguel Rojas went deep to help Miami capitalize on an unusually wild night by Kershaw (1-4). The left-hander tied a career high with six walks, and left after allowing three runs in five innings. Relievers Merandy Gonzalez (1-0) got his first career win. Brewers 6, Royals 2: In Kansas City, Missouri, Jhoulys Chacin and the Milwaukee bullpen pitched the Brewers to their eighth consecutive victory. Chacin (2-1) did not allow a hit until two outs in the fourth. Brewers relievers combined for 3 1/3 scoreless innings, running their streak to 28 straight. The Brewers scored all they needed off Jason Hamel (0-2) in the fourth on two hits, a walk, an error and a pair of sacrifice flies. Only three of the runs were earned after outfielder Jorge Soler dropped a would-be flyout to the groans of about 5,000 fans that braved the cold, wet weather. Yankees 7, Twins 4: In New York, Didi Gregorius homered for the fourth straight game and added two RBIs to his major league-leading total, leading New York to its fifth win in a row at misty, foggy Yankee Stadium. Tyler Austin hit a three-run shot and made a sparkling defensive play at first base to help send Minnesota to its sixth straight loss. Chad Green (2-0) relieved shaky starter Sonny Gray in the fifth inning and got five outs. Aroldis Chapman closed for his fourth save. Lance Lynn (0-2) allowed six runs and seven hits over 3 2/3 innings in his fourth start for the Twins. Red Sox 4, Blue Jays 3: In Toronto, Mookie Betts homered twice and drove in three runs as Boston snapped its season-high three-game losing streak. The Red Sox got their 18th win of the season, tying the franchise record for victories before May 1. Betts hit his third leadoff homer of the season, then put the Red Sox in front for good in the seventh, connecting off Danny Barnes (1-1). Betts has six home runs and seven RBIs in his last seven games. Eduardo Rodriguez (3-0) gave up three runs and six hits in 6 2/3 innings. One night after giving up a walk-off home run to Toronto’s Curtis Granderson, closer Craig Kimbrel worked a 1-2-3 ninth for his sixth save. Phillies 5, Diamondbacks 3: In Philadelphia, Jake Arrieta outpitched Zack Greinke, Aaron Altherr hit a go-ahead three-run homer and Philadelphia topped Arizona. Arrieta (3-0) allowed three runs – one earned – and four hits in seven innings. He pitched out of a bases-loaded, no-out jam in the fourth after walking in a run. Adam Morgan and Luis Garcia combined for a scoreless eighth and Hector Neris finished for his fifth save in six tries. The Diamondbacks had won eight straight games in Philadelphia, dating to 2016. Greinke (2-2) gave up five runs and nine hits in six innings, striking out nine. Nationals 15, Giants 2: In San Francisco, Trea Turner got five hits, Matt Adams homered and drove in six runs, and the Washington broke out of an offensive funk in a big way, routing San Francisco to end a four-game skid. Andrew Stevenson had two doubles, two singles and four RBIs as Washington set season highs for runs and hits (18). Max Scherzer (5-1) struck out 10 in six innings. Adams had an RBI single as part of a three-run first and put the Nationals up 6-1 with a three-run homer off Jeff Samardzija (1-1) in the fourth. Cardinals 9, Mets 1: In St. Louis, Marcell Ozuna hit a tiebreaking two-run single and Michael Wacha won his fourth straight start for St. Louis. Jedd Gyorko added a two-run homer for the Cardinals, which has won nine of 11. Ozuna had just one hit in his previous 24 at-bats prior to a bases-loaded single to cap a three-run third inning. Wacha (4-1) gave up one run on five hits over six innings. He struck out eight and walked one. Steven Matz (1-2) gave up seven runs, just three earned, over 3 1/3 innings. The Mets have dropped six of 10 after an 11-1 start to the season. Mariners 4, White Sox 3: In Chicago, Mike Zunino homered and scored twice to back Seattle starter Felix Hernandez. Zunino doubled and scored in a two-run third and gave the Mariners a 4-3 lead with a solo drive against James Shields (1-3) in the sixth. Nelson Cruz added three hits and two RBIs. Hernandez (3-2) settled down after a shaky start, scattering three runs and seven hits over six innings. The 2010 A.L. Cy Young Award winner struck out six and walked two. Edwin Diaz tossed a perfect ninth for his 10th save. Chicago’s Yoan Moncada hit his first career leadoff homer. At 5-16, the White Sox are off to their worst start since 1950. Rockies 5, Padres 2: In Denver, Jon Gray struck out 11 in six innings and David Dahl lined a two-run triple, lifting Colorado past San Diego. Gray (2-4) allowed three hits and walked one to break his three-game slide. The Rockies took two of three for their first home series win of the season. Tyson Ross (2-2) allowed four runs in four innings and struck out seven as he dropped to 0-6 lifetime at Coors Field. Rangers 4, Athletics 2: In Arlington, Texas, Isiah Kiner-Falefa hit a go-ahead single in the fifth inning and the Texas bullpen protected the lead. Four Rangers relievers worked 4 1/3 hitless innings to stop Oakland’s four-game winning streak. Jesse Chavez (1-0) retired all four batters he faced in relief of starter Doug Fister. Keone Kila pitched a perfect ninth for his fourth save of the season. Kendall Graveman (0-5) took the loss. Tigers 13-3, Pirates 10-8: In Pittsburgh, Jose Osuna, called up from the minor to serve as an extra player for the second game of a doubleheader, hit a three-run homer to give Pittsburgh a split. Chad Kuhl (3-1) tied a career high with eight strikeouts in six innings. Matthew Boyd (1-1) gave up four runs and seven hits in 3 2/3 innings. In the first game, Nicholas Castellanos had four hits and a key home run. The teams combined for 34 hits, including four from Detroit slugger Miguel Cabrera and three from Jeimer Candelario, who scored five runs. Pittsburgh’s Francisco Cervelli had three hits and a career-high six RBIs. Daniel Stumpf (1-0) retired all four batters he faced for his first major league win. Shane Greene pitched a 1-2-3 ninth for his fourth save in six opportunities. Jameson Taillon (2-2) allowed seven runs and 10 hits in 3 2/3 innings. Published: April 25, 2018, 10:30 p.m.